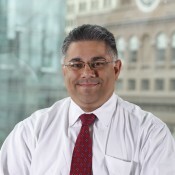 Yash was appointed managing director of the C.V. Starr Research Foundation at The Cooper Union in 2008. He has also been a member of the faculty since 1997 as Adjunct professor of Electrical Engineering. Yash earned both his Bachelor and Master’s degrees in Electrical Engineering at Cooper in 1992 and 1994 respectively. He has been elected or appointed to several posts in the Cooper Union Alumni Association, including Vice-president of membership, Vice-president Faculty Liaison, Secretary/Treasurer, Annual Fund Chair, Phonathon Chair, Young Alumni Committee Chair, and Executive Committee member for 8 years. He has, and continues to, serve the Association on several committees. He was individually recognized back in 2003 as the inaugural recipient of the Young Alumnus of the Year Award. He is married and a father of 2 children, and serves as a member of his hometown’s Environmental Advisory Committee. Prior to his current role, he held senior positions on both the management and technology front with several firms including Damashek Consulting, Lok Technology, Context Integration, Bridge Information Systems and Market Vision. Over the years, his clients have included numerous Fortune 500 and Global 1000 firms, including Accenture, Goldman Sachs, BOA/Merrill Lynch, Merck/Medco, American Airlines, and EMI Music Publishing.